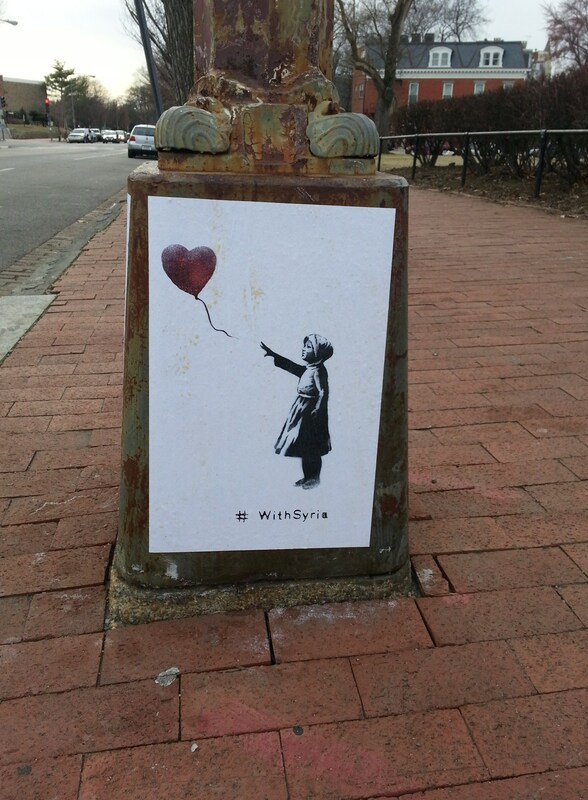 Last week, posters created by elusive graffiti artist Banksy, began appearing on Capitol Hill. The posters created to show solidarity with the rebels against the Syrian government, commemorate the third anniversary of the beginning of the Syrian conflict – March 15, 2011. ANC 6B Outreach & Constituent Services Task Force meets at 7:00pm in Hill Center. Chair Brian Pate has announced that a representative from DC Department of Tax and Revenue will be present to take questions. Murry’s Redevelopment (616 H Street, N.E.) – Trent Smith of Insight Property Group will give a brief presentation on the current status of this project. R.L. Christian Library Site (1300 H Street, NE) – Developer will present regarding efforts to address parking issues arising out of changed plans for development of the site. CHRS Preservation Café – 6:30pm to 7:15 pm, Ebenezers Coffee house, 2nd and F Streets, NE. Money saving preventive house maintenance. PSA 108 meets at 7:00pm, Liberty Baptist Church, 527 Kentucky Avenue, SE. Meeting will feture MPD Lt. J.B. Dykes.